If your attorney's negligence, misconduct or unethical behavior caused you to lose a lawsuit or resulted in financial damages for lost opportunity, you are entitled to seek financial compensation. If you reside or operate a business in the Jacksonville, Florida, metropolitan area, turn to St. Denis & Davey, P.A., for help. 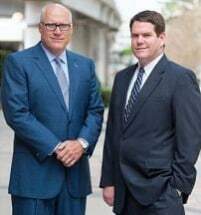 St. Denis & Davey, P.A., attorneys have earned a reputation for holding themselves and other legal professionals to the highest ethical standards. Their lawyers and staff know that after becoming the victim of a negligent attorney, it is difficult to regain confidence in the legal profession. The firm is recognized for practicing with integrity, beginning with responsive communication with clients and a clear explanation of the legal process and billing practices. Co-founder Donald W. St. Denis has earned the highest AV preeminent* peer rating for ethical standards and legal ability and is board-certified as a civil trial lawyer by the Florida Board of Legal Specialization. If you suspect that you lost your case or suffered financial damages because of your attorneys' negligence or malfeasance, you deserve compensation. St. Denis & Davey, P.A., is not afraid to sue other lawyers and law firms.